Generosity of duration contends with novelty of content in this fulsome collection. 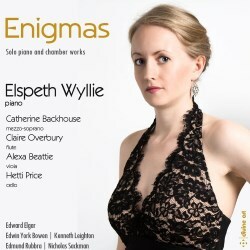 I had misgivings about hearing Enigma in a version for solo piano. This reading accounts for approaching half the playing time on the disc so there was a fair bit at stake. In fact it works wonderfully well at least until the closing EDU variation where the 'transition' from orchestra to keyboard at times sounds pretty stilted. The gap between an essentially percussive instrument and the undulating orchestral oratory just cannot be bridged successfully at those points. The rest, and that's most of Enigma, works most eloquently and this deserves its own life in the concert hall. It was after all Elgar's own handiwork, prepared contemporaneously with the full score. Each variation has its own track. The competition comes primarily from Ashley Wass on Naxos. One other critic, writing about the Wass, points out that the piano version can be heard on at least two other versions: Anthony Goldstone (MRCD94001) playing Elgar’s Broadwood piano and Maria Garzon on ASV CDDCA1065. I have not heard the Wass or the other two but Wyllie has a firm yet sympathetically yielding grasp of this fine music and, apart from occasionally in EDU - a problem for all pianists - makes it sing without cloy or shudder. The Leighton Elegy shines and comes across as a touching piece. It works well in the hands of Wyllie and Price. Bowen's lambently romantic three-movement Flute Sonata is one of a clutch of 15-20 minute sonatas in this composer's catalogue. Its light-filled and faintly Gallic ways have attracted several recordings. This, from Claire Overbury and Elspeth Wyllie, is lovingly shaped. It proceeds on stylish toes - pearly and pointed rather than leaden. The only music by a living British composer in this 78-minute collection is Nicholas Sackman's six-movement ten-minute suite. It is in tuneful mode: sec, witty, atmospheric, touching and making playfully inventive use of irregular rhythms. Sackman leads us around all sorts of unexpected twists and turns. The music half reminds me of Constant Lambert. Sackman is not over-represented in the catalogue although you can catch him on Metier and NMC and end up wanting to hear more. Edmund Rubbra’s Alabaster Sonnets I recall from an Alfreda Hodgson LP (Pearl SHE 559) but counter-tenor Mark Chambers also recorded them in the late 1990s on Deux-Elles 1012. Here I like the emphasis given to the viola. Catherine Backhouse also makes a strong impression but I could not always catch the words - fortunately they are set out in full on p.5 of the liner booklet. The liner booklet, in English-only, is equal to the task. The music is engagingly profiled by Ms Wyllie. The Enigma friends 'portrayed within' are listed and each gets a short description. There are photos and brief bios of each musician. Enigma works well and is accorded a natural voice that demands to be heard. The added works are also well worth your listening contemplation.